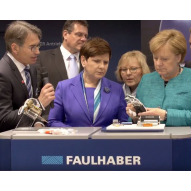 During her traditional opening tour at the start of the Hannover Messe, German Chancellor Dr. Angela Merkel visited the exhibition stand of the drive specialist FAULHABER from Schönaich, together with the prime minister Beata Szydło of the partner country Poland. Gert Frech-Walter, member of the FAULHABER GROUP management team and managing director of FAULHABER Germany together with Karl Faulhaber, managing director of FAULHABER Switzerland and managing partner, showed product highlights and application examples to impressively demonstrate the diverse portfolio of small and miniaturized drive systems as well as the extensive technology know-how of the internationally positioned high-tech company. 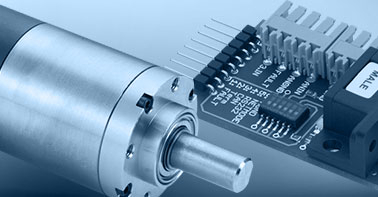 FAULHABER is a key innovator in many application areas – from robust DC motors, such as in the Philae lander of the Rosetta space probe to precise servomotors in bionic hand prostheses to the filigree micro drive with an outer diameter of just 1.9 mm as a technological cornerstone for minimally invasive heart pumps. 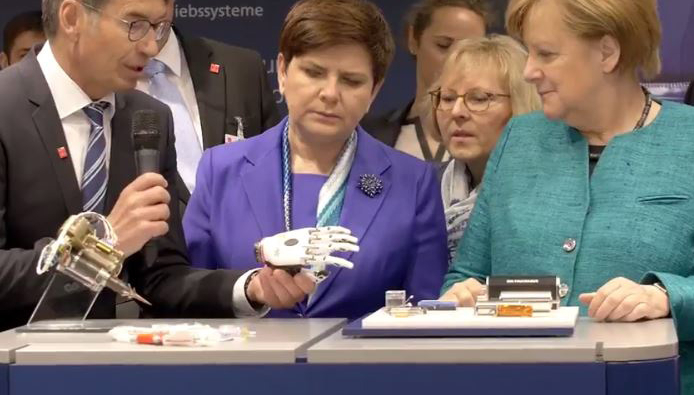 Taking centre stage was once again the bebionic hand developed by UK based company Steeper and the subject of a recent acquisition by OttoBock a world-leading manufacturer and supplier of prosthetic limbs and orthotic supports and wheelchairs to facilitate independence. 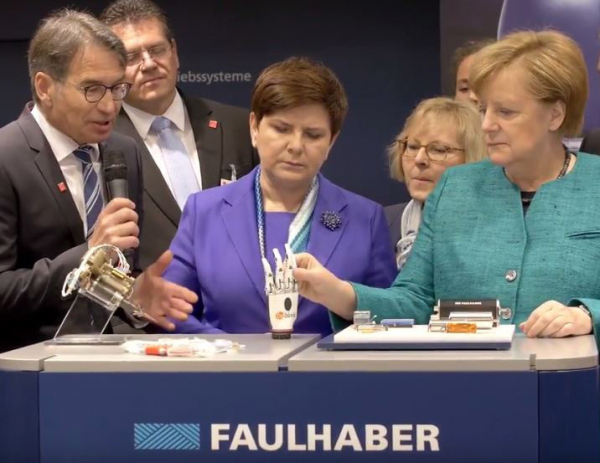 The motor technology used in bebionic was developed from extensive collaboration with FAULHABER and UK distributor partner EMS. The new 1016…SR and 1024…SR motor technology utilising rare earth magnets and high copper density coils resulted in best in class performance and made these motors perfect for this application. Extensive customisation was also a major factor in optimising these drive systems to exactly match the requirements of this challenging environment. The Chancellor also expressed special interest in the new BP4 motor series. 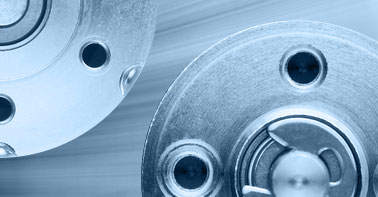 Thanks to an innovative segment winding, these highly dynamic drives feature not only an outstanding torque-to-size ratio but also weigh less than half as much as standard motors with comparable power. 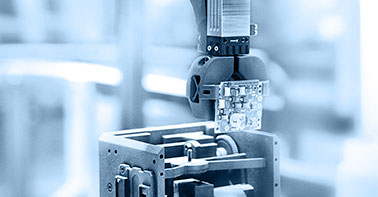 "We developed this series with applications in professional electrical tools and robotics in mind, where maximum torque and minimum weight and size are important," explains Karl Faulhaber. 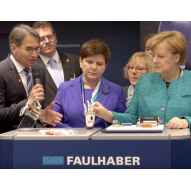 The German Chancellor was very impressed by the practical examples, the range of applications, the innovative strength as well as the broad technology spectrum of the FAULHABER drive systems. 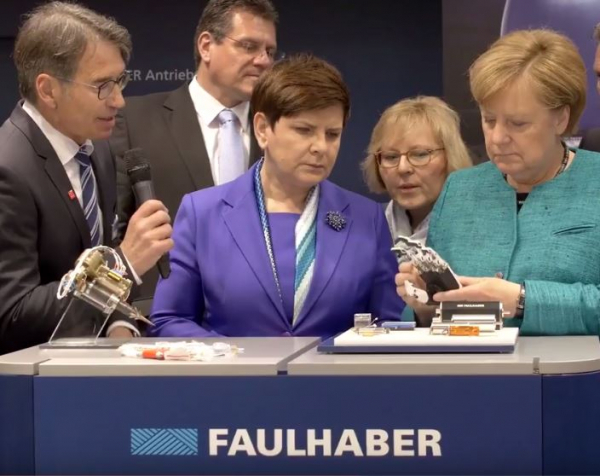 To see the video of Dr Merkel's visit please click here or contact EMS to learn more about any of the products mentioned.